A whole host of light sources, each with its own distinguishing features, is available to aquarists. These are what we use from day to day in our homes, but they are absolutely out of the question in aquariums: the quality of light is poor, and this type of bulb gives off too much heat. Incorrectly known as neons, these tubes contain a gas that turns fluorescent under the action of an electrical discharge. They give off little heat and are available in various lengths and intensities. They last for 3,000-4,000 hours, or around a year. The quality of the illumination decreases over the course of time, however, and this can be clearly seen if an old tube is replaced by a new one. For this reason, never change all the tubes in a tank at the same time, as plants may be traumatized by this abrupt change in the intensity of the light. A used tube can be recognized by its black or dark ends. Fluorescent tubes come in various colors: firstly, the cold white or industrial white tubes, which are to be avoided, and the daylight tubes. The latter approximate sunlight the most closely and provide well-balanced lighting. 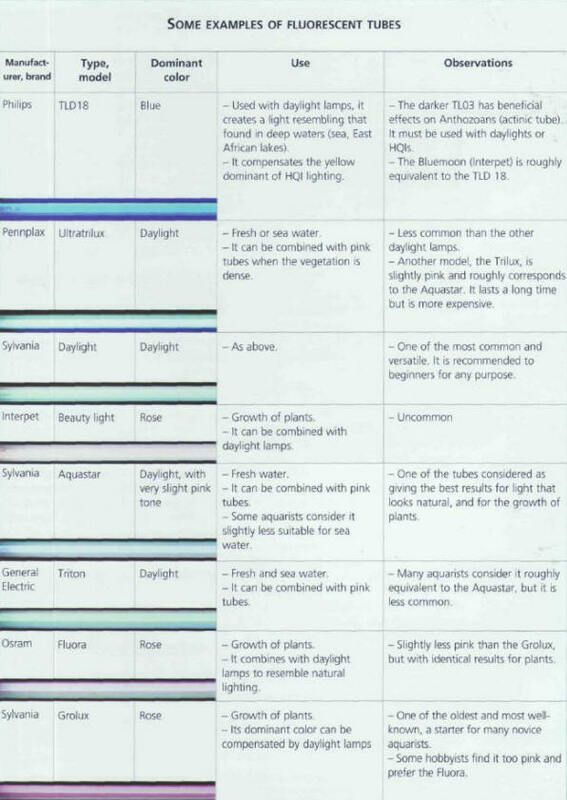 Also available are colored tubes with a variety of dominants, including the tubes with a pink dominant used in horticulture, which are particularly effective for the growth of plants, as they mainly emit blue and red rays, which are trapped by plants and used in the photosynthesis process. Some aquarists do not appreciate their somewhat unnatural color, which tends to exaggerate the red and blue tones of fish. Sometimes tubes with a blue dominant are combined with white to create a light reminiscent of that found in deep waters. Such tubes are beneficial for corals and other animals from the same group, and have therefore acquired the name of actinia tubes. 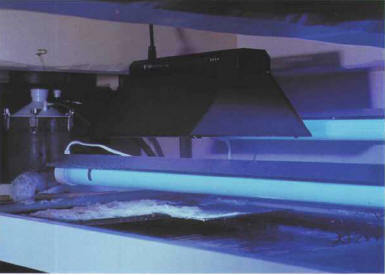 Some blue fluorescent tubes can compensate the dominant yellow of HQI bulbs, resulting in a balanced lighting which is as pleasing to the inhabitants of the aquarium as it is to the eye of the beholder. Other colors are available, but they are less common. It is sometimes possible to find tubes with a yellow dominant, which are combined with blue tubes to achieve a more balanced light. A fluorescent tube is not plugged directly into the mains: you must insert a transformer, the ballast, and a starter which produces the electrical discharges required. 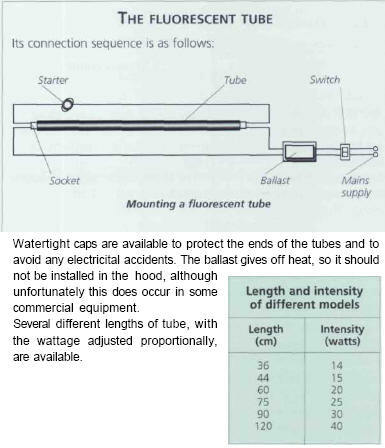 If you buy a well equipped aquarium, or one with a lighting hood, the tubes will be provided. This does not always mean that you can rest easy, as the intensity of the pre-installed tubes is sometimes insufficient. The tungsten filament of incandescent bulbs is here replaced by another metal, which prevents them from turning black. These lamps can be equipped with a rheostat, but they are generally little used by hobbyists. An electrical discharge between two electrodes vaporizes a gas, such as mercury or sodium vapor - which emits an intense light. These lamps have a slight yellow dominant, imperceptible to the human eye, which is compensated by a blue fluorescent tube. They heat up and consume more electricity than fluorescent tubes. Some, known as HQI daylight, are prized by aquarists, but they are expensive and impractical for normal tanks. They are mainly used in seawater aquariums over 0.5 m in height, as they help to acclimatize Anthozoans with Zooxanthellae. Watertight caps are available to protect the ends of the tubes and to avoid any electricital accidents. The ballast gives off heat, so it should not be installed in the hood, although unfortunately this does occur in some commercial equipment. Several different lengths of tube, with the wattage adjusted proportionally, are available. ЯВАНЦЫ , народ в Индонезии (89 млн. человек), основное население центральной части о. Ява. Живут также в Малайзии, Австралии, Нидерландах и др. Общая численность 89,6 млн. человек (1992). Язык яванский. Верующие в основном мусульмане-сунниты.